It's a night of friends, fun, and festivities all to benefit Hemophilia of North Carolina, a nonprofit 501(c)3 organization dedicated to improving the lives of those affected by a bleeding disorder. We’re sorry, it is too late to get a discount on hotel reservations. Last updated on Wednesday, January 23rd, 2019. Ticket purchases over the fair market value of $40 per person are tax deductible. All tickets will be available for pick up at the door. Ticket includes hors d’oeuvres, dinner, two bar tickets (cash bar available for additional drinks), dessert, raffle ticket for door prizes, and $10,000 in “fun money” chips for gaming. Order eight individual tickets by Monday, January 21st, 2019 and we will reserve a table for 8 in your name; we'll also toss in $5,000 in additional “fun money” in appreciation of your support. 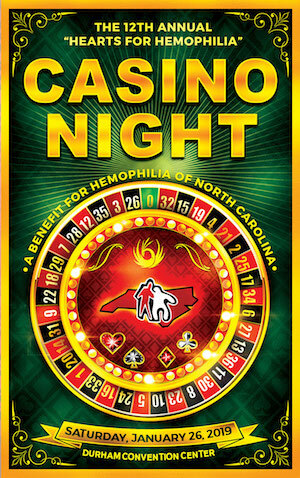 If interested, please contact us at info@hemophilia-nc.org. This is a great opportunity to treat your family, friends, or staff to a fun night out for a great cause. Corporate sponsor packages are available starting at $250. Contact the HNC Office at 800-990-5557 for complete details. Donate an item of at least $250 value and get your name in the event program. Donors of items $500 value will also get a highlight in the HNC newsletter. In the past these included get-away weekends, sporting event trips and tickets. If you have something you’d like to donate for auction, please contact us at info@hemophilia-nc.org or call 800-990-5557. Downloadable files*: Information Brochure (pdf, 2.5mb), Ticket Order Form (pdf, 285kb). This page was last modified on Thursday, March 7th, 2019.